Photography and Life by dr Frank: Yams - great tasting recipe - Low cost great nutrients! 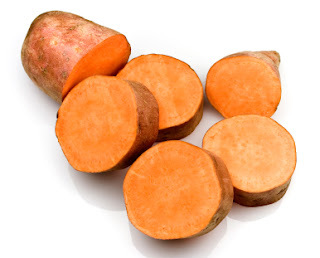 Yams - great tasting recipe - Low cost great nutrients! Do you want to add more vegetables to your diet, to your families diet or have pounds of yams left over from a recent sale at the grocery store with no idea what to do with them? Cut up the yams into small pieces and put them into a pot. Add the raisins and cinnamon and pour the water or apple cider over the ingredients. Add a tablespoon of maple syrup and one of agave. Cook slowly until the yams are tender. Carefully pour the ingredients into a Blentec, Vitamix, food processor, or blender able to handle the contents. Blend until very smooth and serve hot or cold depending on your families likes. I enjoy this tasty treat cold or hot and as a great mid day energy boost. A variation to this recipe is blend 2/3 of the yams and pour over the other 1/3 and serve as part of the main meal.